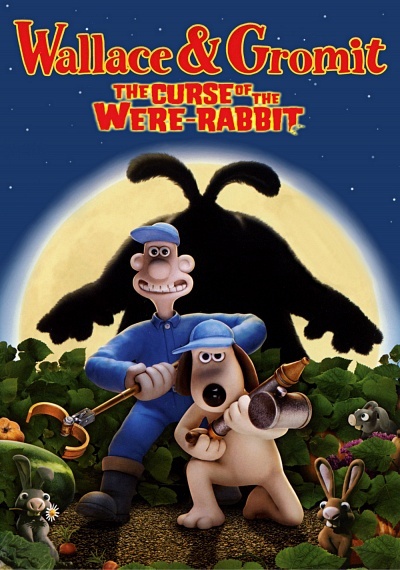 Wallace & Gromit: The Curse of the Were-Rabbit :: Movie Information :: RabbitTV GO! From the Academy Award® - winning creators of Wallace and Gromit comes "one of the most enjoyables family films of the year" (Jeffrey Lyons, NBC). When their town's prized produce starts disappearing, our cheese-loving inventor and his savvy canine companion must use all their wildly imaginative inventions to try to capture a mysterious beast of epic and fluffy proportions! Hailed as "terrific family movie" (Russ Leatherman, CNN and Moviefone.com) and "whimsical, funny and endlessly inventive" (Roger Ebert, Ebert & Roeper), The Curse of the Were-Rabbit is a hare-raising adventure for the whole family!